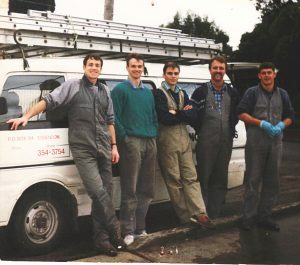 In our 30th year it’s a great opportunity to go back to our roots and look at how window cleaning has changed since we started in 1987. Over this time, we have seen many changes in the industry – many of them positive and with the aim to provide safer cleaning conditions for our teams and better results for clients. When Terry, Chris, and I started Danihers Window Cleaning in 1987, the most commonly used equipment for out-of-reach areas were 30, 40, and 60 – yes 60! – foot ladders. There was also the bosun’s chair, descent and ascent systems, and aerial lifts. Only decades before that, window cleaners would climb out of the windows and attach a special belt to hooks or bolts embedded on each side of the windows. The window cleaner would then lean back against the belt with his toes on ledges only a few inches wide and clean the window – scary business! It was dangerous work in the 80s and 90s climbing up 30, 40, and 60 ft ladders to clean windows three storeys high with only handheld tools to use. The 30 and 40 ft ladders were a double extension that used ropes to aid the second extension in sliding up the first, adding the extra height required to reach two storey buildings. Thank goodness we played footy and were fit, as this was a serious day’s work. Up and down the ladder up to 30-40 times a day, moving the ladder by physically carrying it at full extension – this was not for the faint of heart! Our eldest brother Terry loved this ladder, and had no qualms with shouldering much of the heavy lifting. When required, we used the 60 ft ladder to reach third storey windows. This triple extension ladder was a real nightmare – terrifying at full height, and completely unsafe. 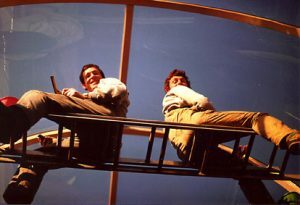 Thankfully, after only a few months of trial and error, we decided that we needed a safer alternative; we explored elevated work platforms – which were fantastic – and mechanical booms that could reach up to 25 floors while you were safely connected to it via a cage. Much more reassuring to work in! Wind was always the major factor that we had to contend with, as ladders could easily become unstable. We were very fortunate that we never had a major accident in the 15 years of using ladders; we never had a staff member lose a day’s work – or worse – due to a fall, but the risk was always there. We only had two major incidents that I can recall and we were lucky enough to walk away from both of them. The introduction of tighter regulations at the start of this century changed the industry.  The Occupational Health and Safety Act 2004 aimed to prevent falls from height, which are responsible for a major percentage of serious accidents at work.  The regulations recommend that a fall protection system be provided when working above two metres; this includes using the right type of equipment, and ensuring that the work is properly planned and supervised to minimise risk and injury to cleaners. While in the past we just climbed the ladders, didn’t think about the risks and got on with the job, the Danihers team now takes the time to assess each site and educate our clients on the process. It’s fantastic to see our teams using far safer and more efficient cleaning methods​ such as PPE, anchors and harnesses, suitable access equipment, as well as developing Safe Work Method Statements (SWMS). In addition to keeping abreast of the latest equipment, it is critical to ensure a safe environment by keeping up to date with all regulations and regularly attending safety seminars and training sessions. S queegees are still our equipment of choice! 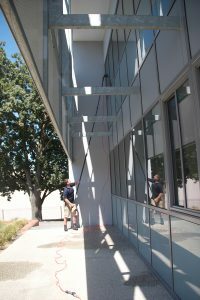 We get our best result when we can get to the glass with a squeegee using elevated work platforms. The next best and safest option is using water-fed poles. These systems use deionised, purified water fed through long poles with a brush on the end. The windows are brushed and then rinsed to remove all dirt. Heights of 70 ft can be reached using this system, even while working from the ground. This makes high access window cleaning safer and much more cost effective. The major advantage of this system is that the window requires no polishing or detailing work and can be left to dry naturally leaving no spots, smears, or streaks. The only disadvantage, however, is that although the carbon fibre poles are light they are still physically demanding to manoeuver at a great height, often making the job more time consuming. I will be watching with great interest to see where the window cleaning industry goes over the next 30 years. 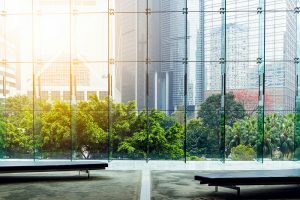 Innovations in equipment development will certainly lead to even safer working environments, and who knows, the advent of self-cleaning glass and robotic cleaners may change the entire face of the industry. Only time will tell! 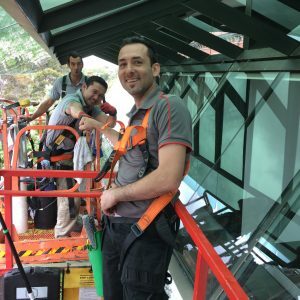 A special thank you to Matt McPherson and Mansour Tanios (both pictured above) as well as their respective teams for their fantastic effort in providing window cleaning services to our clients.